Photo courtesy of University of Minnesota Athletics. Sidney Peters, a School of Kinesiology senior majoring in kinesiology and minoring in biology, and Gophers Women’s Ice Hockey goaltender is one of 11 nominees for the 2018 Hockey Humanitarian Award. The award is presented by the Hockey Humanitarian Award Foundation and is presented annually to a hockey student-athlete who makes significant contributions to both his/her team and community through leadership and volunteerism. With over 785 volunteer hours logged, Peters is involved in many community outreach volunteer activities. She is a certified Emergency Medical Technician and volunteers for both the University of Minnesota EMS and the Rush-Copley Emergency Department in Aurora, IL. In the summer of 2016, Peters traveled to Haiti with Project Mediashare, an organization dedicated to providing and empowering Haitians with quality health care. While she was there, she volunteered at Hospital Bernard Mevs, which is the country’s only critical care and trauma hospital. Peters has also volunteered as the head goalie coach for Hockey Ministries International seasonal sports camps in Chicago. During her Gopher career, she has given back to the community by volunteering locally with HopeKids, Special Olympics Minnesota, University of Minnesota Masonic Children’s Hospital. Finalists for the Hockey Humanitarian Award will be announced in February, and the 2018 recipient will be honored on April 6 as part of the NCAA Men’s Frozen Four weekend in St. Paul, MN. 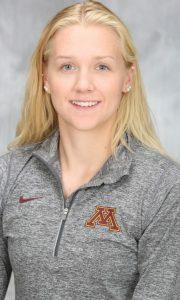 For more information on Peters and her nomination, visit gophersports.com.